Jingles in his humble beginnings. Jingles is ready to debut. 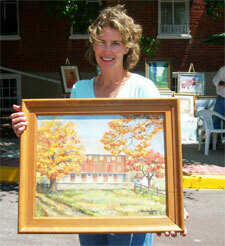 Trudy and Tom Siak offer a 1976 original oil to benefit Boyertown's Arts and Activities Alliance. Dr. James Tribbett (in dedication to Angie, Bonnie, and Dawn). 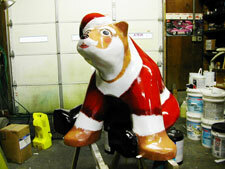 All of our sponsors have been enthusiastic supporters of our Bear Fever project since the project began. Some have “held on” waiting for Julie to sign on to the project, and we're happy to have finally persuaded her to participate! Smale's Printery offers services including addressing and letter service, advertising, brochures, business forms, catalogs, circulars, envelopes and letterheads, full color printing, invitations, layout and design, periodicals, programs, and sales books. 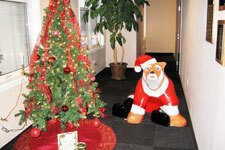 The Boyertown Holiday Open House Committee began in fall 2003 and attracted over 500 members of the community accomplishing its mission of bringing the community together to have fun and get to know one another better. Gretchen Lea, chairwoman, and interior designer, captures the spirit of the committee in her mission statement, in saying, "being part of the community helps make one's life whole." The tour is coordinated through the collaborative efforts of several Boyertown civic organizations--the Boyertown Area Historical Society, Building a Better Boyertown, Berks-Mont Business Association, Boyertown Senior High School, individuals from the community, and local businesses. Building a Better Boyertown (BBB) is a non-profit organization formed in 2002. Boyertown, PA is a Main Street Community, receiving funding from the Pennsylvania Department of Community and Economic Development and private donors to focus on downtown revitalization. BBB staff and volunteers develop and accomplish tasks that maintain Boyertown's historical heritage, promote downtown Boyertown and attract people to the community. They concentrate on business recruitment and retention and on providing technical assistance and grant opportunities for property and business owners in the Main Street District to make facade improvements enhancing the town's Victorian architecture. The Twin Turrets Inn, located in Boyertown, Pennsylvania; is a comfortable 19th century mansion in the heart of a small 19th century town. Built for Horace K. Boyer, circa 1860, the home is now restored to its original Victorian splendor.? T oday the Inn has ten rooms, including two suites which feature the copper turrets. All rooms have air conditioning, cable television, telephone and a private bath with thirsty towels. Thick bath robes are provided for your relaxing pleasure and a restful night's sleep is assured in your king or queen size bed. In the morning a full breakfast awaits at a time convenient to you. Recognized internationally, Twin Turrets Inn ensures that the corporate traveler not only has a massage chair in the parlor but also the facilities necessary, including a secured wireless network, to conduct business as usual. T he Inn's serene gardens and patio provide tranquility and, for the more active guest, a health club facility is located nearby. The Twin Turrets Inn is a gateway to the beautiful Oley Valley and a short drive will take you to historic Valley Forge, Philadelphia and the lush farm lands of the Amish. The Twin Turrets Inn is also just a few hours from New York City and Washington D.C. For the tourist, there is something for everyone - antiques, farmers markets, museums, wineries, sporting events, outlets and fine dining. B usiness, Pleasure, or Retreat,? The Twin Turrets Inn ?Boyertown, Pennsylvania? is a nice place to hang your hat. A delightful stay is assured. Whenever asked to submit a biographical sketch, I am often tempted to make one simple statement -- "I love to paint." My experience as an artist, is one filled with exciting, challenging commissions, and interesting people. I find pleasure in exploring a variety of styles in order to express my feelings or capture a mood. The images I create in my work frequently reflect the mood swings that control my experiences as an artist. Many people are curious about the variety of mediums that I use to create my paintings. I enjoy painting in oil, acrylic or watercolor. The medium I choose is determined by the effect I wish to achieve in my compositions. From local landscapes to imaginary impressionistic compositions, I am never at a loss for subjects to paint. I work on location when possible and rarely leave the studio without a sketchbook and camera. My work brings me great joy and it can be very demanding as well. 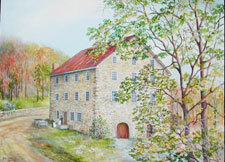 Featured at Red Hill are paintings depicting some of Longacre's most popular images The Old Mill in Oley , The Wash House in Earlville, Mid-Winter Homecoming, and Footsteps to the River (The Mouns Jones House). 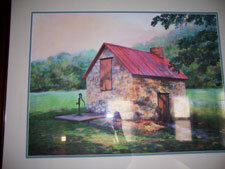 The Old Mill in Oley is a traditional 4'x'5'oil of a traditional mill. The Washhouse is a study of summer sunlight on a modest red-roofed structure that Longacre admired during one June Sunday afternoon birthday party held at the Moyer farm. Footsteps to the River (The Mouns Jones House) won first prize for the Schuylkill River Heritage Area. 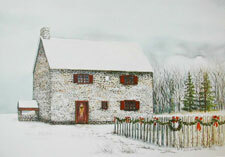 Mid-Winter Homecoming is a giclee fine art reproduction of a farm in the Oley Valley and one of her favorite subjects she calls a “grand old farm” to which she returns for inspiration since she discovered it in 1980. Her first large painting of it, Mid-Winter Morning is part of the collection mounted at Landis Store and became the first print Longacre offered in 1985. In 2004 she completed another painting of it, reversing the original and offered it successfully as a giclee print from which she had small prints made for charity. 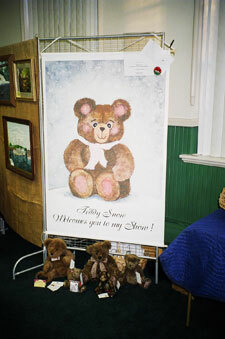 In 2006 she created it again in watercolor and used it as her Christmas card. Zuber has added Longacre's work to his Boyertown office recently as well. Boyertown features The Victorian House , an acrylic on canvas, Oh, Christmas Tree , Mid-Winter Homecoming , The Pay School and Valentine's Day , a lovely stone barn with a valentine carved into the wooden shutters. 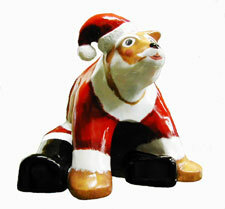 Longacre recalls that the first of her Christmas Tree paintings belongs to Bob Hilbert as part of his collection of Longacre originals; but Longacre has changed colors, background, and decorations on the tree over the years and has recently added glitter which “decorates” her studio through spring each year. Also featured in Boyertown is Longacre's hand enhanced glicee entitled “Pay School,” a beloved building throughout Longacre's life located on Hoffmansville Road. Of Pay School , Longacre shared that she drove by the schoolhouse everyday of her life contemplating the many secrets it held of children who played in the schoolyard, of town meetings held by assorted citizens, and of the teachers who brought their knowledge to the quiet countryside. She described the mix of feelings watching the humble building “age” over the years. Knowing that her beloved building was doomed for the bulldozer one day, eager to meet the requests of residents who loved the building or who had relatives who schooled there, and wanting to capture the image before its demise or before it was repointed and lost its integrity, Longacre made Pay School her mission in recent work recognizing her own life journey in the building's maturation. “It's my gift to the community,” she said. The Pay School, which operated from 1846-1868, served the Congo area's families who pooled their money to provide education for their children. One of the school's last teachers went on to become one of the first professors to teach at today's prestigious Perkiomen Preparatory Academy.